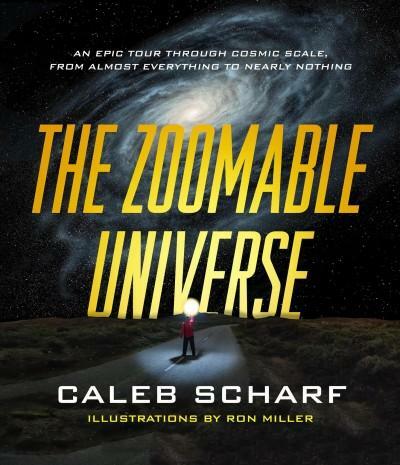 Caleb Scharf is the award-winning author of The Copernicus Complex and Gravitys Engines, and the director of the Columbia Astrobiology Center. He has written for The New Yorker and Nature, among other publications. He lives in New York City with his wife and two daughters. Follow him on Twitter at @caleb_scharf. Ron Miller is a Hugo Awardwinning illustrator and author whose work has appeared in National Geographic, Scientific American, Smithsonian, the international bestselling app Journey to the Exoplanets, the definitive editions of 20,000 Leagues Under the Sea and Journey to the Center of the Earth, and many other books. He served as the art director for the National Air and Space Museums Albert Einstein Planetarium. He lives in Virginia. Visit his website at www.black-cat-studios.com. Inspired by the classic Powers of Tena film by Charles and Ray Eames, which was based on a book by Kees Boekethe award-winning astrobiologist Caleb Scharf and the acclaimed artist Ron Miller take us on a breathtaking, cutting-edge journey through all known scales of reality, from the largest possible magnitude to the smallest. Their unforgettable tour begins at the edge of the observable universe, a scale of 1027 metersabout 91 billion light-years from a human standing on the surface of the Earth. And they end in the subatomic realm, at 10-35 meters, where the fabric of space-time itself behaves in a way that confounds all the rules of physics we currently know. In between are galaxies, black holes, solar systems, stars and planets, oceans and continents, plants and animals, microorganisms, atoms, quantum fields, and much more. Stops include the surface of Neptune, the back of an elephant, and the contours of a DNA strandall beautifully depicted by Millers original artwork, elucidated by captivating infographics, and illuminated by Scharfs inviting prose. Gorgeously designed to allow readers to track their progress from one scale to the next, The Zoomable Universe takes a whimsical approach toward explaining our place in the universe. It is a celebration of scientific discovery, a testament to our astounding ability to see beyond our human-scaled vantage point and chart a course from the farthest-flung edge of the cosmos to its mind-boggling depths: a journey that will thrill readers of every age in a package they will treasure for years.